According to a report by The New York Times, at the council “Cardinal” Pericle Felici explained that “the Pontiff had been moved to his symbolic act of charity by discussions of world poverty during the current session of Ecumenical Council Vatican II” (“Pope Paul Donates His Jeweled Tiara To Poor of World”, Nov. 14, 1964). The good thing is that the tiara — also called the triregnum — which Montini abandoned was one made after the pontificate of Pope Pius XII, so it was a Novus Ordo tiara, made specifically for Paul VI, and it looks accordingly. The item was later brought to the United States by Cardinal Francis Spellman, and is now kept on display at the National Shrine of the Immaculate Conception in Washington, D.C. The fate of the wicker tiara, on the other hand, is not known. 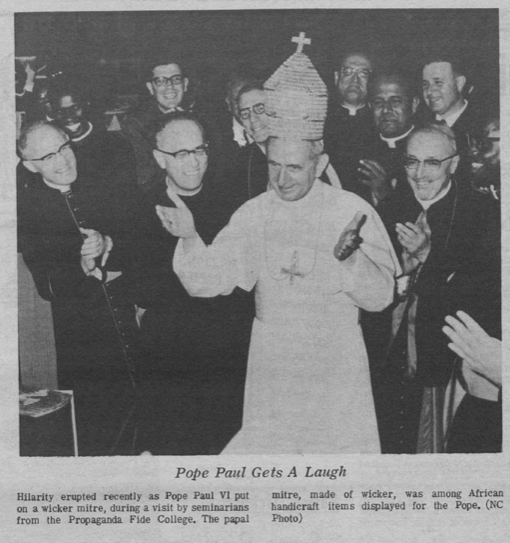 Of course Paul VI is not the only pretend-Pope to have a problem with the Papacy. None of his successors ever wore the tiara again, and Benedict XVI was the first to eliminate it even from the “papal” coat of arms. The papal tiara, which is also called the triregnum, consists of three tiers to signify the triple office the Pope possesses: that of teaching, governing, and sanctifying. Considering that Paul VI actually held none of these legitimately, it was quite fitting that he should give up this symbol of the papal office. If only he had relinquished his claim to being Pope, too.